As kids in Nepal, the beginning of September marked the start of our countdown to a 45 day long vacation. For children without extended summer vacations, this was the best part of the entire school year, and included two of our most celebrated festivals – Dashain and Tihar. When I was in school, Dashain for me meant new clothes, good food, extra playtime with my cousins, swinging on bamboo swings, and of course receiving money from each and every elder relative. Similarly Tihar meant more good food, and lots of gifts from my brothers. Today these festivals are much more meaningful and hold more significance in my life, mostly because I understand them better. The fifteen days of Dashain celebration occur during the bright lunar fortnight ending on the day of the full moon. Dashain commemorates the victory of good over evil and is symbolized by the slaying of Mahisasur (the demon) by the goddess Durga. 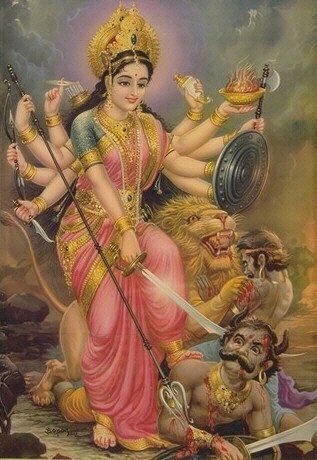 According to Hindu Mythology, Mahisasur was terrorizing the earth by taking the form of water buffalo, and the first nine days signify the battle between the goddess Durga and the demon. On the tenth day the demon was slayed, and the next five days mark the celebration of victory. In modern day, every home is cleansed and decorated as an invitation to the goddess Durga. The first nine days are filled with various rites and rituals leading up to the most celebrated tenth day. Families from far and wide get together on this day to receive blessings of good fortune, well being and prosperity from their elders in the family. This gathering on the tenth day is seen as unifying families and relatives. In fact it is believed that if one does not visit their elders during dashain, it means that they are cutting off all ties and is marked as the end of their relationship. About 2 weeks later comes another big festival called Tihar or Yama Panchak. This five-day festival is dedicated to Yamraj, the god of death. According to Hindu mythology, Yamraj visited his sister Yamuna after a very long time and she was so happy that she did everything possible to please him during his five-day stay. Before leaving on the fifth day, Yamuna worshipped him and prayed for his longevity and in return Yamaraj presented his sister with many gifts. Today, these five days are celebrated as Tihar and the last day is celebrated as Bhai Tika and it is dedicated to the brothers. Sisters worship their brothers and pray for their long and prosperous lives. In return, brothers present their sisters with gifts. Tihar is also called the Festival of Lights. The third day of the festival is celebrated as Laxmi Puja: the day dedicated to goddess of wealth. On this day every household as well as the office buildings are decorated with colorful lights as invitation to the goddess of wealth. These lights are lit all night starting from the third day to the final day. The entire city is decked with lights and people drive around to enjoy these views. However, this year, Nepal Electricity Authority has urged the public to not use the decorative lights and electrical appliances such has rice cooker, air conditioner, clothing iron etc during these times as the shortage of power still remains. If NEA decides to cut off the power during the festival time, people with solar or diesel power back up will still be able to light their houses, but it will not be the same for those that do not have access to power back up. There are many activities during these festivals. Families get together to play cards, fly kites and enjoy feasts. My favorite is playing on the bamboo swing. The heights of these swings can be above 20 feet and it is believed that if you leave the ground swinging during dashain, the swing will take away all ill feelings. My vacation is now limited to 7 days for Dashain and 3 days for Tihar but as some people say; it is the smell in the air that still makes this the best time of the year!